This key textbook considers the mechanics of geomaterials at a wide range of scales, both in time and space. 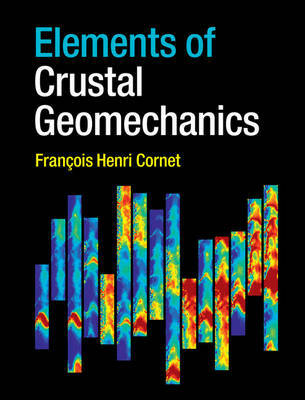 It provides a detailed introduction to the study of crustal geomechanics, focussing specifically on the seismogenic crust. The author demonstrates how continuum mechanics principles can provide efficient solutions to geomechanics problems at various scales, taking into account the multiphase characteristics of the geomaterials as well as discontinuities such as fractures and faults. Field and laboratory observations are combined with basic mathematical theory to build solutions with known levels of uncertainty. Particular consideration is given to the use of microseismicity. Case studies are provided, and practical results from numerical modelling are used to illustrate the applicability and limitations of current theories. Accessible explanations of mathematical formulations, convenient summaries of the key equations, and exercises make this a valuable reference for students and researchers in geomechanics, geophysics, structural geology and engineering.